Rossignol has been making skis since 1907 and in their legendary history they have become one of the winningest ski brands in the world, including 6 gold medals at the Calgary Winter Olympics. If pro skiers put their trust in Rossignol we are pretty sure they are a safe bet for the rest of us. With their headquarters based in Sallanches, Francs just a few miles from Chamonix and the world famous home of extreme skiing Mount Blanc, Rossignol does more than make racing skis, they make some of the best big mountain skis available. With a team of pro athletes out there constantly pushing their own limits and the limits of their equipment the technology Rossignol uses is a driving force behind this evolution of skiing. Experience another best day, every day, in any snow conditions. 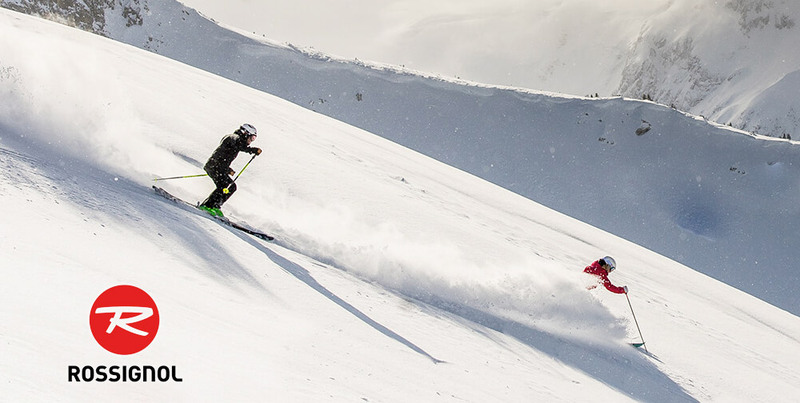 You want to ski in extreme terrain and in any conditions or snow, consider yourself a powder addict, who loves hucking cliffs then the all-new EXPERIENCE 84 Ai is the perfect all-mountain ski for you. This ski is ideal for carving fresh groomers or exploring mixed snow and terrain with a race-developed LCT that combines with new Air Tip VAS for the best snow contact and line control. The freeride inspired profile of the Experience 81 allows you to drift and release turns with ease setting you up to tackle what is coming next. Experience all-mountain freedom with the Experience 88 TI, a ski made for carving high-speed groomers on exploring further off-trail into all kinds of conditions. This is one of Rossignol’s most versatile all-mountain skis, blending the heart of a high-performance carving machine with a freeride-inspired profile for more playful fluidity and ease. The rocker tip will allow the ski to come out more easily in fresh snow and thus provide better flotation, while a rocker on the back of the ski allows for better maneuverability in powder. While the race-developed LCT combines with Air Tip VAS for rock-solid power, stability and control in any conditions. The all-new HERO ELITE PLUS+ Ti from Rossignol is a powerful and precise that is made to go fast, you will want to rent this ski to lay down trenches in fresh corduroy down Aztec. A perfectly balanced pair of skis that blends race-level technology with enhanced on-trail comfort making it ideal for the everyday skier who likes to go fast. All-new Line Control Technology meets a wider 78mm waist width and GS-inspired sidecut that makes this a touchj more forgiving than other race skis while maintaining the precision and balance you need to push your limits. LCT technology eliminates counter-flexing for maximum stability and optimized trajectory through the turn for total control of your line. The Soul 7 has become famous as being one of the most innovative and playful skis in the freeride arena. This ski blends versatility and ease-of-use with progressive freeride performance to let you use the entire mountain as your playground. With the all-new Air Tip 2.0 that reduces the weight of the skis where it is least needed while maintaining optimum you get a comfortable ride. This also helps center the gravity of the ski concentrated under the skier’s foot which drives more weight into the sidecuat and helps hold the shape of the turn. A Carbon Alloy Matrix gives the ski a powerful feel while at 106mm underfoot the all-new SOUL 7 HD is more powerful and has lots of float in an uncompromising ski that goes wherever the snow takes you. Some say the Sky 7 from Rossignol is the ultimate fusion of lightweight agility and freeride versatility. Whether skiing the frontside of the mountain or earning your turns in the backcountry, the 98mm waist combined with new Air Tip 2.0 and Carbon Alloy Matrix provides a progressive, lightweight blend of stability, floatation, and edge grip to go wherever the snow takes you. The all-new SKY 7 HD offers uncompromising free-touring performance and this has become one of the fastest growing segments of skiers here in Aspen.